What Does The Duty To Mitigate Damages Mean? 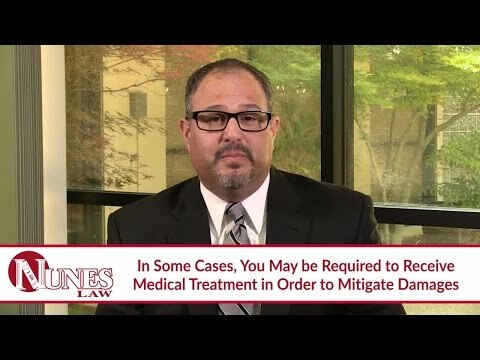 Listen as California Attorney Frank Nunes explains what it means when an insurance company tells you that you have a duty to mitigate your damages. If you were recently in a car crash, you may have received a letter saying you have a duty to mitigate your damages. What this means is that you must take available actions to minimize your pain and suffering or wage loss that you will claim for as a result of the accident. For example, you would be obligated to undergo a surgery that would lessen your pain and suffering. Likewise, you would be required to return to work when your doctor has released you from medical care and said you can return. This prevents people for claiming more money than is necessary for their bodily injuries and time missed from work. Watch the video to learn more. If you have additional questions regarding damages and your responsibilities following a car accident, I want you to call me at (559) 436-0850. I welcome your call. Visit our educational website at https://www.nuneslaw.com for more videos and media content from our law firm.